The beautiful plaid lampwork beads I used in this bracelet are designed and handmade by Carmen Berenice in Laura Brito’s community workshop in Mexico. They are of the exceptional quality shown in Venetian Murano lampwork and have a unique Scottie flair. These highly detailed beads are 13mm in diameter with pale rose pink and plummy fuschia plaid, and have raised yellow and black dimples. I’ve combined these special beads with sweet 7mm plummy rose rustic Rubies and 9mm Rose Quartz orbs all spaced with black jet glass beads. 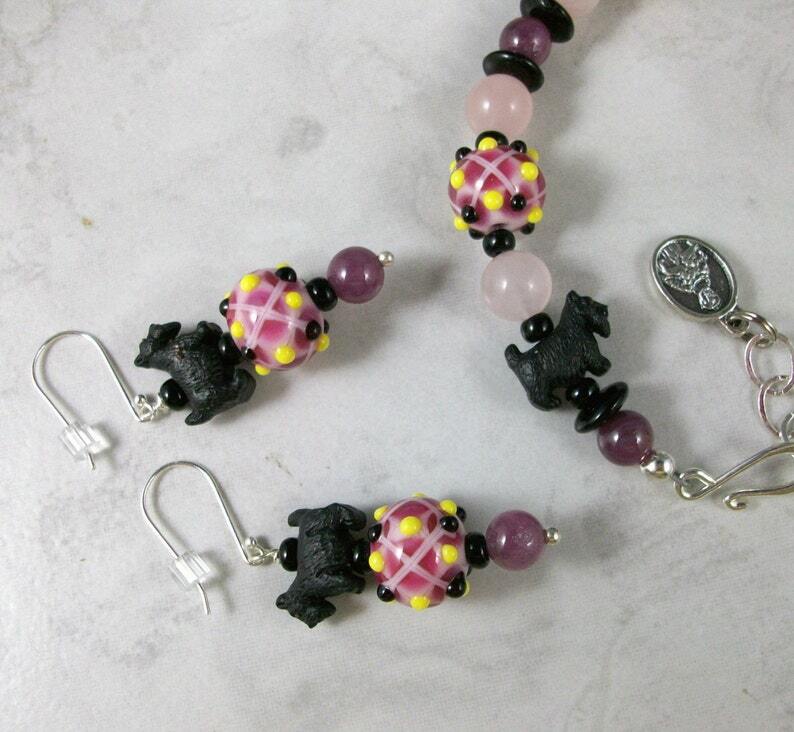 A diminutive 14mm black 3-D Scottie marches to the tune of the pipers and drums near the clasp. I’ve used a simple sterling silver hook to close this bracelet with rustic 6x8mm hammered sterling silver chain which adjusts the size to fit from 6 ½” to 8” (165-200mm) wrists and added a two sided sweet Italian pewter St. Francis medallion to finish the end of the chain. The matching Scottie earrings dangle 1 ½” (38mm) from simple sterling silver French wires. This set is fun and elegant at the same time!